Baroness Thatcher, 87, died on Monday morning. Former Prime Minister Margaret Thatcher has died following a stroke on Monday morning. Her spokesman Lord Bell said confirmed the news, saying: "It is with great sadness that Mark and Carol Thatcher announced that their mother Baroness Thatcher died peacefully following a stroke this morning." Downing Street said Baroness Thatcher will receive a ceremonial funeral with military honours at St Paul's Cathedral. It is understood Lady Thatcher was consulted about details of the funeral arrangements, and made clear that she did not want her body to lie in state. The streets between Westminster and St Paul's will be cleared for the procession, the date of which is yet to be decided. The Thatcher family had asked well-wishers to donate to the Royal Hospital Chelsea instead of leaving flowers. The flag at Downing Street was lowered to half-mast in tribute on Monday. Prime Minister David Cameron, who is returning early from his trip to Spain following the news, paid tribute to the 87-year-old. In a statement on the Downing Street Twitter feed, he said: "It was with great sadness that I learned of Lady Thatcher's death. We've lost a great leader, a great prime minister and a great Briton." Buckingham Palace said the Queen has been saddened by the death of former Prime Minister Baroness Thatcher and will send her family a private message of sympathy. Buckingham Palace said in a statement: "The Queen was sad to hear the news of the death of Baroness Thatcher. Her Majesty will be sending a private message of sympathy to the family." The Labour party is suspending all campaigning in the local elections until further notice. Labour leader Ed Miliband said although he did not agree with her politics, he greatly respected her achievements. He said: "I send my deep condolences to Lady Thatcher's family, in particular Mark and Carol Thatcher. "She will be remembered as a unique figure. She reshaped the politics of a whole generation. She was Britain's first woman Prime Minister. She moved the centre ground of British politics and was a huge figure on the world stage. "The Labour Party disagreed with much of what she did and she will always remain a controversial figure. But we can disagree and also greatly respect her political achievements and her personal strength. "She also defined the politics of the 1980s. David Cameron, Nick Clegg and I all grew up in a politics shaped by Lady Thatcher. We took different paths but with her as the crucial figure of that era. "She coped with her final, difficult years with dignity and courage. Critics and supporters will remember her in her prime." Former prime minister Tony Blair today described Baroness Thatcher as "a towering political figure". He added: "Very few leaders get to change not only the political landscape of their country but of the world. Margaret was such a leader. Her global impact was vast. And some of the changes she made in Britain were, in certain respects at least, retained by the 1997 Labour Government, and came to be implemented by governments around the world." Former political opponent Lord Neil Kinnock said: "I recognise and admire the great distinction of Baroness Thatcher as the first woman to become leader of a major UK political party and prime minister. I am sorry to hear of her death and offer my sympathy to her family." Gordon Brown, former Labour Prime Minister, said he has contact Baroness Thatcher's family to pass on his condolences. He said: "Sarah and I have sent messages to Lady Thatcher's son Mark and daughter Carol, offering our condolences to them and to the Thatcher family and commemorating Lady Thatcher's many decades of service to our country. "She will be remembered not only for being Britain's first female Prime Minister and holding the office for eleven years, but also for the determination and resilience with which she carried out all her duties throughout her public life. Even those who disagreed with her never doubted the strength of her convictions and her unwavering belief in Britain's destiny in the world. "During our time in Number 10, Sarah and I invited Lady Thatcher to revisit Downing Street and Chequers - something which we know she enjoyed very much. But it was sad for her and her family that she lost her devoted husband Denis almost ten years ago and that she was unable to enjoy good health in the later years of her retirement." Former Labour cabinet minister Lord Healey said: "I'm very sorry that she's died, we became quite friendly in her later years. She was very frail at the time, both physically and mentally, and she even hugged me and gave me a kiss when we met once by accident. "I disagreed with her violently when she became prime minister, she actually said in public, there is no such thing as society, and had strong opposition inside her own party for a lot of the time she was there. "I didn't agree with her politics at all, at any time, but as a human being I felt very sorry for her towards the end of her life." Asked how history would view her time as prime minister, he said: "People's view of her after her death will be as divided as it was during her life." First Minister Alex Salmond said: "Margaret Thatcher was a truly formidable prime minister whose policies defined a political generation. "No doubt there will now be a renewed debate about the impact of that legacy. Today, however, the proper reaction should be respect and condolences to her family." Canon Kenyon Wright, who chaired the Scottish Constitutional Conference, thanked Baroness Thatcher for helping Scotland realise devolution was needed. He said: "We never met, but I once said I felt I would have liked her. Not, I hasten to say because of her views and policies, both of which I believe to have been fundamentally flawed, but because she had a conviction and consistency that put her head and shoulders above many politicians. "In one important respect, we owe her a kind of perverse thanks. But for her, we might well not have had a Scottish Parliament today. I often called her 'the Mother of the Scottish Parliament' until some in the press started to call me its Father. "Margaret Thatcher said 'No' to Scotland, but the way she did so, was a major factor in enabling us to say 'Yes'." Lady Thatcher suffered several small strokes in 2002, and received medical advice against accepting any more public speaking engagements. 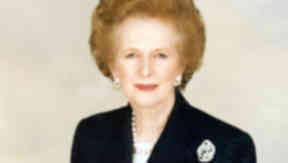 Liberal Democrat leader Nick Clegg also paid tribute to Baroness Thatcher. He said: "Margaret Thatcher was one of the defining figures in modern British politics. "Whatever side of the political debate you stand on, no-one can deny that as prime minister she left a unique and lasting imprint on the country she served. "She may have divided opinion during her time in politics but everyone will be united today in acknowledging the strength of her personality and the radicalism of her politics. My thoughts are with her family and friends." Lady Thatcher earned a place in the history books as the first woman prime minister when she entered Downing Street in 1979. Over the next 11 years even her critics admitted that she changed the face of the country. Baroness Thatcher, 87, was the longest serving Prime Minister of the UK in the 20th Century and was in charge between 1979 and 1990.